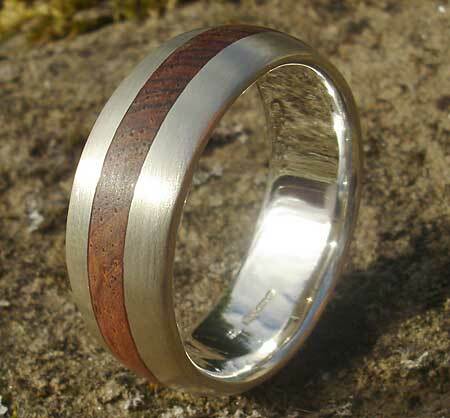 Domed Wooden Inlay Silver Wedding Ring : LOVE2HAVE in the UK! 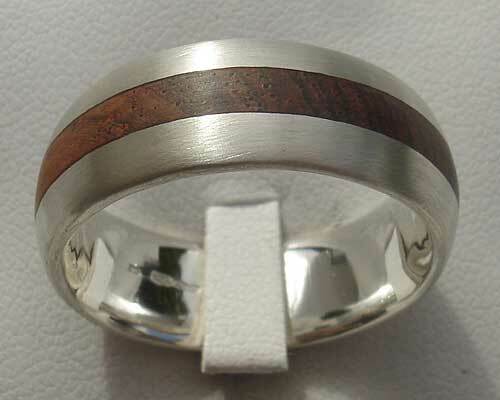 An 8mm width silver and wooden wedding ring with a 2mm width orangey red rosewood inlay. Our wood inlay rings are all handmade. They have a very organic look to them so are of great interest to customers looking for something contemporary with a natural, earthy or spiritual design style. These rings will appeal to couples looking for unique wedding rings. We often get asked about the durability of the woods in these rings. The wood is a hardwood, but it does alter over time and become darker. Other widths also available - please email us for further details. Inlay/Width(s) Available: Rose wood, 2.6mm.